While it wasn�t in a quaint British seaside town, the British Masters was held on a sunny day on April 22. 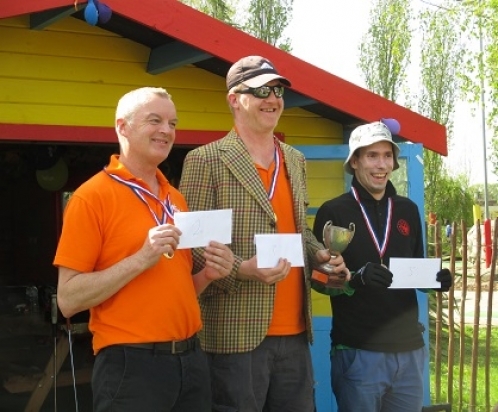 The four round tournament took place at Mr. Mulligan�s Dino Golf in Sidcup on the Jurassic Explorers course. The field of 29 had a difficult job that day as they had to make the right series of ball and shot selections to conquer a course that both provided some straight aces chances but also had some terrifying decisions. With scores that hovered around even par 36 all day, there might not have been a more stressful decision than whether or not to go for the ace on the volcano 17th hole, where the difference between an ace and a three (or more) could make or break a players round and perhaps tournament. The tournament started with some hot rounds by familiar tour names with Terry Exall taking the lead with a 32 and smattering of players one or two strokes behind. It would be far from a runaway tournament however as fortune turned to misery and vice versa for many players depending on which round they were in. Marc Chapman would shoot the low score of the day in round three with a 31 that helped to balance a 42 during his first round. The top ten players were separated by only a few strokes after the morning three rounds and by the time the tournament was over, only seven players would average under 36. The minigolf mantra of �I�m not putting bad but�� was heard throughout the course as players struggled to find rounds under par. You can find pictures of the event at The Putting Penguin's album or the BMGA Facebook album. The next stop on the BMGA tour is the 2018 British Championships which will be played on Saturday 12th and Sunday 13th May on the Pirate Course at Hastings Adventure Golf.